The crowd focused on the TV with rapt attention. On screen, their hostess ladled chocolate batter and cheesecake filling into fluted baking cups, producing a mass of the perfectly turned-out treats and loading 1,000 of them onto a Super Heroes-themed tower. 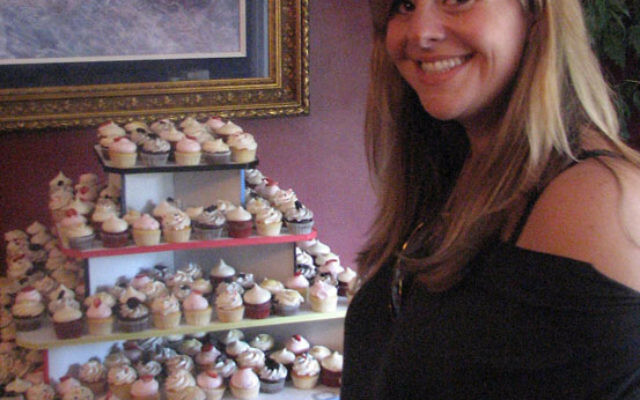 Some 200 people, including friends, family, and some “die-hard” customers gathered at the White Meadow Lake Country Club on Aug. 16 to watch Lori Kutner Levenson compete in Cupcake Wars, a reality show on the Food Network. And even though the White Meadow Lake resident, owner of Sugar Mommy Cupcakes in Denville, was not declared the winner, her fans were solidly in her corner. The episode, filmed in March, was shot in one very long day, from 7 a.m. until 10 at night, Levenson told her guests. She also told them that the cameras, to get the really tight close-ups, are just inches from the bakers’ faces. But the hardest part, she said, is just what one would expect — the anxiety and the one-hour preparation time limit. “The clock ticks faster than you could ever imagine,” she said. Trained as an artist, Levenson holds a BFA from the Fashion Institute of Technology. She went into makeup design after college and stayed in the field until she moved back to White Meadow Lake. When her youngest son, Jacob, now three, was born, she realized that commuting to a job in New York City was out of the question. “I realized, I could have a cute, tiny bakery with a beautiful vase filled with roses on the showcase; instead of making someone else beautiful, I could work for myself,” she said. 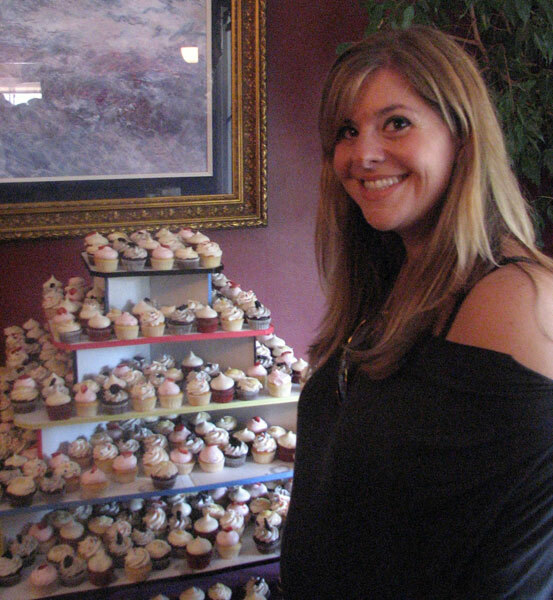 In January 2009, she opened the 600-square-foot Sugar Mommy Bakery on Diamond Road in Denville. In October, she has plans to move to a larger space — 1,700 square feet, still in Denville. At the viewing party, guests enjoyed plenty of cupcakes (and other treats) as, in the dark about the outcome of the episode, they watched Levenson knock out two other competitors to make it into the final round against Anthony Valerio of Wonderland Custom Cakes in Los Angeles. They kept rooting as Levenson revised the recipe for her chocolate cheesecake cupcake and created the huge display featuring a “hangout” for the comic book and science fiction heroes that were the theme of the episode. When Valerio was named the winner, many at the gathering had to take a moment to absorb the news. But disappointment gave way to celebration as they remembered that winning a slot on the show and competing through the final round was an achievement worth celebrating — and one with its own rewards. On the day after the episode aired, sales at Sugar Mommy Cupcakes spiked. Levenson usually bakes 250 cupcakes a day; on that day, she baked 500 and was well on her way to selling them out by mid-afternoon. “New customers came from Livingston and West Orange,” she said. “It’s unbelievable because in this area, we can reach so many people all over New Jersey.” And there were plenty of fans writing on her Facebook page and calling in to offer support. Sugar Mommy Cupcakes, located at 60 Diamond Spring Road, is open Monday-Friday, noon-6 p.m., and Saturday, 10 a.m.-3 p.m. The shop is closed on Sunday, but Levenson sells her wares from a truck at the Denville Farmers Market from 8:30 a.m.-1 p.m.